You can save yourself a lot of extra steps by taking advantage of Outlook’s features that are available even when you can’t see its window. 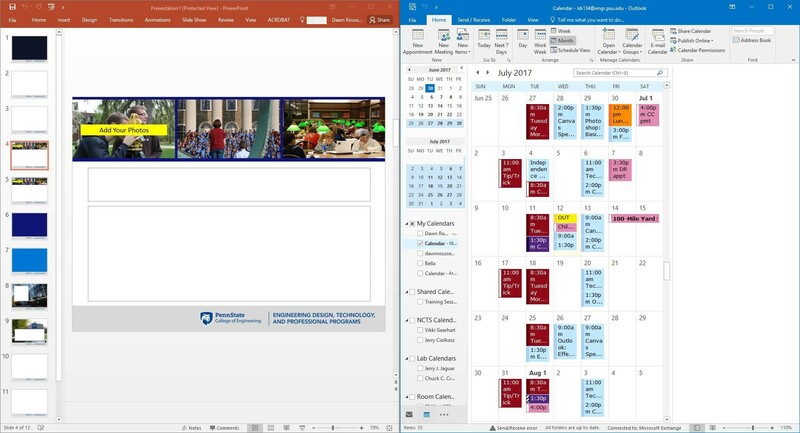 Simply right-click on the Outlook icon to access the ability to create a new email message, appointment, meeting, contact, or task. 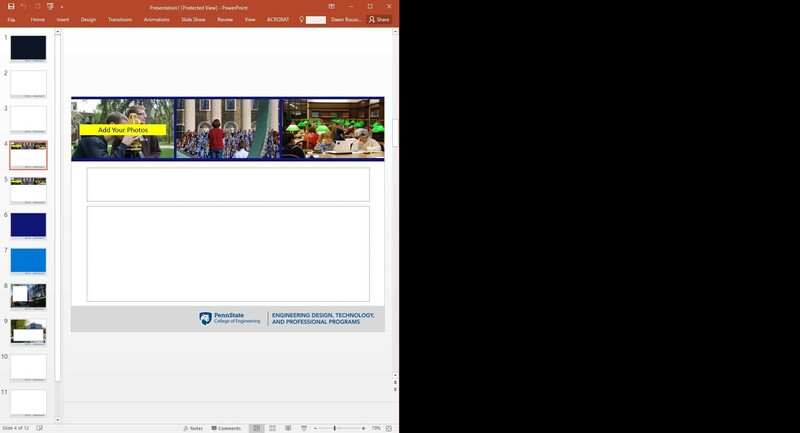 The video below shows what this Outlook Tasks menu looks like. Click the fullscreen icon in the lower right corner of the video player to view a larger version. This entry was posted in Tips & Tricks on July 26, 2017 by Dawn Roussey. 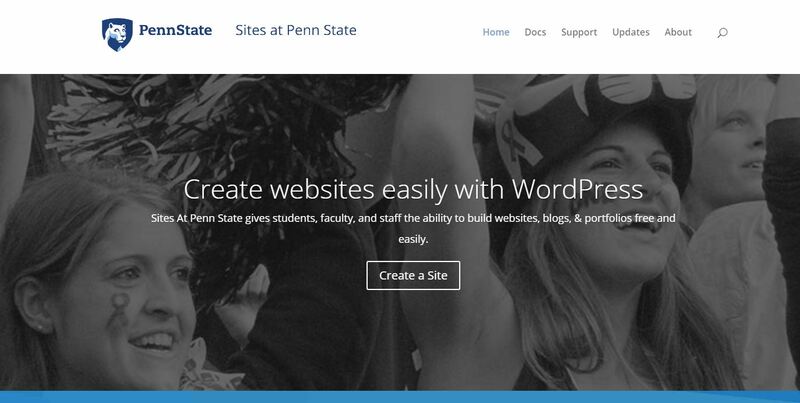 Penn State faculty, staff, and students can create websites for free using Sites at Penn State. To get started, visit http://sites.psu.edu/ and click on Create a Site. Then, you can designate your site address and site title. View the video below to see the creation process. You can create up to 25 sites per user and up to five sites per day. If your needs require a larger limit, contact the Sites Help Desk. This entry was posted in Tips & Tricks, Uncategorized on June 22, 2017 by Dawn Roussey. Working with one monitor is great, and two is even better. But, if you have ever wished you had a third, this tip may be one for you. You can make your monitor a split-screen quickly and easily by holding down the Windows key and then pressing the left or right arrow buttons. Your active window will move to the right or left of the screen, depending on which arrow button was pressed. The active window will reduce in width and move to the side of the screen corresponding to which arrow was pressed. Then, release the Windows key. You will be provided with thumbnails of your other open windows. Select the one you want to appear in the other half of the screen. Your other applications show as thumbnails next to the window. Click on the thumbnail to activate the window in the other half of the screen. 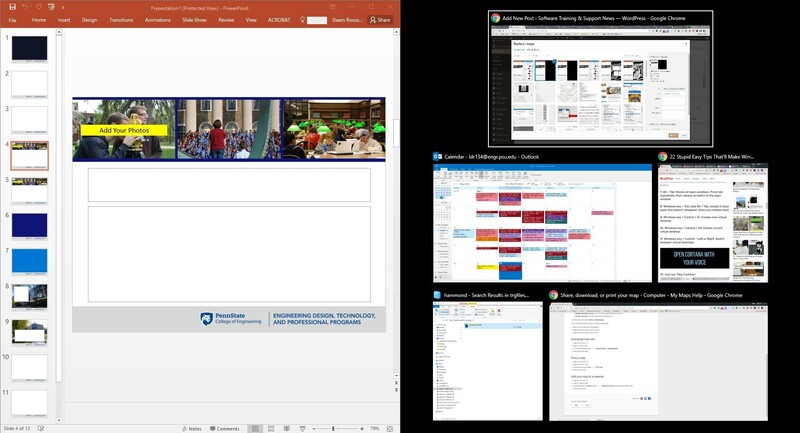 Using the shortcut enables you to quickly open two windows on the same monitor. This entry was posted in Tips & Tricks on May 22, 2017 by Dawn Roussey.